Aegis Studios brings out more for their Crazy8s rpg system with the release of Mecha8s. Who doesn't love giant powered armor suits battling it out against one-another? If you just said "me." then... you're kinda lame, but that's alright. We love you, anyway. The Mecha8s book is fully compatible with all the other Crazy8s books. So you can have your wizard or psychic or super hero fight with or against these new mecha. Aegis Studios is proud to announce the release of Mecha8s! 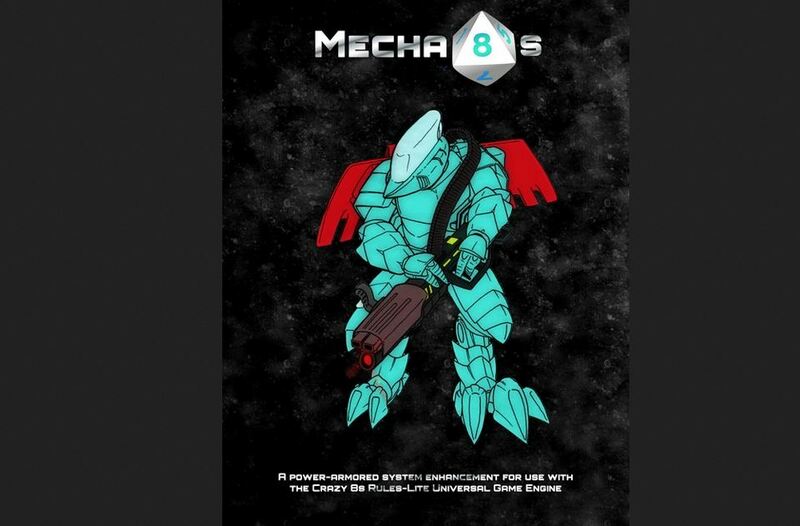 Mecha8s is a system enhancement for use with the Crazy 8s Rules-Lite Universal Game Engine. This sourcebook is intended to provide supplemental rules material to allow Talespinners to craft amazing stories full of adventurers who battle it out wearing potent suits of armor sporting all manner of powerful weaponry. As the Crazy 8s Rules-Lite Universal Game Engine is designed to be a rules-lite RPG experience that can be easily learned, Mecha8s seeks to introduce useful material to craft these stories without bogging the game down with numerous, complicated rules. Mecha8s is designed for use with and requires the use of the Crazy 8s Rules-Lite Universal Game Engine. The rules contained herein expand upon the rules in the core game engine. Mecha8s introduces new heavily armed and armored suits of powered armor designed to be added to any existing Crazy 8s game. These rules are fully compatible with Cyber8s, Fantasy8s, Psychic8s, Spacer8s, Super8s and Magic8s. Mecha8s is released under the Open Game License, allowing anyone to use these rules as a jumping off point for creating their own worlds and game settings. Those of you who wish to explore the possibility of magic in your Crazy8s game should check out Magic8s, a FREE expansion that offers a rules-lite, flexible, free-form magic system for use with the Crazy 8s system. Mecha8s was written by Christopher Cortright and developed by Travis Legge.